Find out more about SPU’s School of Health Sciences, and it’s undergraduate and graduate nursing programs. 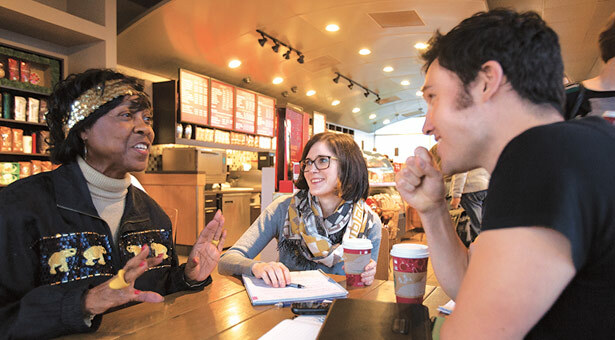 From left: Volunteer Rose Ratteray meets with SPU nursing students Lindsey Bruce Ono ’11 and Judah Ivy in a Tukwila, Washington, Starbucks store. Rose Ratteray gets misty-eyed discussing the favorite gift she has ever received. Last Christmas, she was given a black, leather-bound edition of Spoon River Anthology to replace her 40-year-old, dog-eared copy. It sits in a place of honor next to her Bible — a visible pairing of friendship and faith. Launched in 2009, the Older Adult Partnership Project establishes meaningful, intergenerational connections. A pair of nursing students in SPU’s School of Health Sciences are teamed with a volunteer senior citizen. Groups meet four times throughout the academic year to interact, and students practice communication skills, health assessment, and breaking down possible stereotypes. More than 200 students have participated in the program since its inception. While it is a graduation requirement for the student nurses, the process offers fulfillment beyond the grade. Older-adult participants range from 60 to nearly 100 years old. Most live independently and are active in their communities, from Federal Way to Everett, Seattle, and the Eastside. SPU collaborates with organizations — such as the Retired and Senior Volunteer Program of King County — to connect with volunteers, a core group of 45 older adults. Many have participated since the start. Ethan Crawford, 69 years old, is volunteering for the fourth year. Crawford and his wife welcomed a childhood friend into their home following a terminal cancer diagnosis. The nursing students were compassionate witnesses to the love and care surrounding the friend’s end-of-life process. Brian Hinnenkamp, a second-year nursing student, was one of Ratteray’s previous student partners. The experience influences his current work as a nurse technician at the University of Washington Medical Center. “The bedside should be honored and hallowed ground. It’s a privilege to serve people in a nursing capacity,” he says. It was during a home visit that Ratteray read a poem to Hinnenkamp from her beloved but battered copy of Spoon River Anthology. Moved by her reading, he reciprocated by gifting Ratteray with a new edition.